The arrival of autumn invites us to take a more sophisticated and feminine style, leaving behind the more casual and relaxed summer look. To do this, we can not just change our clothes and accessories, but we can also get it with makeup. 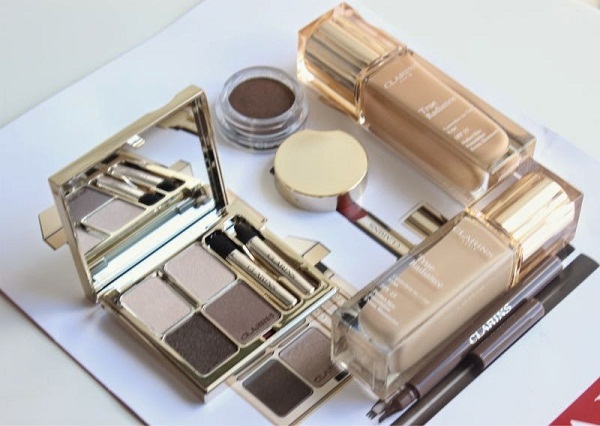 To help us, Clarins offers new makeup collection Ladylike a complete set of products that will help us achieve the chic look for this season. One of the keys to a chic and elegant look are the eyes. With the “Pro Sourcils” Clarins kit we can frame our gaze defining our brows and enhancing the eyes of the most sophisticated manner. To this end we have a mini-clip that will allow us to shape eyebrows as accurately and three makeup powder for greater definition. The kit comes complete with a brush to comb the eyebrows, wax to fix them and make powder to illuminate the eyelids. To Clarins innovation in their products is essential. So the new foundation fixing eye, Fixante Base Yeux Eclat Minute offers us a unique product in make-up and treatment. This new product not only illuminates the eye thanks to the 3D pigments but prolongs makeup with mattifying powders. In addition, oat sugars with an immediate tightening effect. The collection is completed with shades of lipsticks, intense and feminine and eye shadows more elegant brown and nudes to complete our more sophisticated this fall look. Furthermore, Clarins offers tips to make up our eyes with a natural or more elaborate image. Finally, in addition to the fall collection, Clarins in their innovation efforts have created True Radiance SPF 15, a foundation that illuminates and corrects imperfections, providing us once again that we are perfect this fall. With its moisturizing formula, which contains light-reflecting pigments, combats dull complexion and enhances luminosity. The plant moringa seed extract, with its anti-pollution effect, reveals the natural radiance of the skin. In addition, with its action “hydration 24 hrs.” Ensures the supply of water needed for the skin to regain its vitality. You see, with Clarins products Ladylike collection and the new foundation, get the most elegant look for this season is simple.